The current financial climate is making many of us worried about our money. The worst part of the whole credit crunch situation for many is that they feel powerless. One way to take control and feel a little more confident about your financial situation is to create a budget…and stick to it! Sound money management could help you save a cash cushion for when times are tighter or help you cut back if you’re already feeling the pinch. Obviously the aim of creating a budget is to make sure that your money goes further or to help build up some savings. However, there are a few other additional benefits. Using a budget for money management will help you to analyse where it is that your money actually goes. You may well realise that you could cut back and make savings quite painlessly because you are mindlessly spending money in some areas. Similarly, creating a budget will help you to prioritise your spending and think about what you really need and want before putting your hand in your pocket. Often using a budget and prioritising spending does make financial savings but it is likely that it will also mean that you appreciate ‘treats’ more. If you eat out all the time it doesn’t feel special anymore. However, if you’re trying to trim your eating out budget and budget to go out for food just once a month, it’s much more likely to have a sense of occasion. By budgeting and taking control of your finances you’ll feel much more confident and in control. Creating a budget really isn’t hard. It’s usually sticking to one that’s a bit trickier! It’s basically about balancing your incomings and outgoings and ideally making your outgoings so much lower than your income that you can make savings. Firstly, you’ll need to know what you have going out every month. Some outgoings will be pretty much fixed, such as rent, mortgage, utilities bills etc. Others will vary from month to month, for example food, travel, clothing. 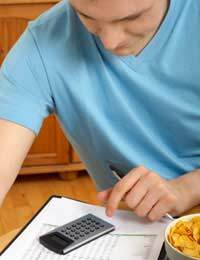 For the variable costs try to track your spending for a while to come up with a representative average. Wages from employment. Only include overtime if it’s a regular thing and you can work out an average. If it’s just the odd month it could skew your figures. Any extra income such as rent from family or a lodger. Work out your income weekly or monthly, then take your weekly or monthly outgoings away. If you’re left with a negative figure you’ll need to make some cutbacks. If you have some leftover, you’re breaking even and can use some money for savings. Either way, it’s likely that you can trim your budget down quite a lot once you know what you’re actually spending and what you have coming in. See if you can switch utility deals, shop around for food and household goods, cut your entertainment budget or arrange a cheaper mortgage, for instance. Adjust the figures to what they need to be for you to break even each month and try to live within these figures. It’s likely you’ll soon be challenging yourself to keep trimming areas of the budget! Are you Receiving all the Benefits you're Entitled to?